Geography plays a huge role in any nation’s success. From natural disaster risk to trade accessibility, location usually helps define growth prospects. For example, landlocked nations are severely limited by their lack of access to the ocean. They often rely on a neighboring country’s port to access global shipping lanes. As such, industrialization proves very difficult for them. Likewise, places like Indonesia and the Philippines are located entirely in high earthquake risk zones. Nations prone to flooding, hurricanes, and other disasters are generally less developed because of these occasional setbacks. Yet some countries are more fortunate than others. Being near profitable borders, important trade routes, or simply areas less prone crises means greater opportunities along with less risk. We can’t change a nation’s spot on the map – but you can choose where to invest. Here’s our list of Asia’s top five most strategically located countries. Located in the heart of Indochina, Thailand shares borders with four other high-growth economies – namely Laos, Myanmar, Malaysia, and Cambodia. Three of those countries are growing at a rapid pace of around 7% yearly. Because of this, Thailand can easily benefit from the rise of its neighboring frontier markets. Store shelves in Cambodia, Laos, and Myanmar are all packed with imported Thai goods. Meanwhile, companies like Bangkok Bank and Siam Cement Group have already expanded into every single one of their high-growth neighbors. Thailand doesn’t just depend on its bordering countries though. A vast coastline along the Andaman Sea means the “Land of Smiles” attracts tourists in droves. Over 30 million people visit Thailand each year. Thailand has had longstanding plans to build a canal between its gulf and the Andaman Sea. Such a development would be immensely profitable while cutting days off shipping time. Perhaps more importantly, they have the potential to become a transport base for all of Southeast Asia. Thailand’s strategic location in the region’s center, proximity to India and China, along with its four borders and easy access to two different seas could help make that become reality soon. Despite ranking among Asia’s smallest countries, Singapore is at the center of many crucial shipping lanes. The “Lion City” is ideally positioned at the Malay Peninsula’s tip. Vast amounts of oil and countless other goods, often shipped to and from China, transit through the Strait of Malacca which begins right off Singapore’s western shore. 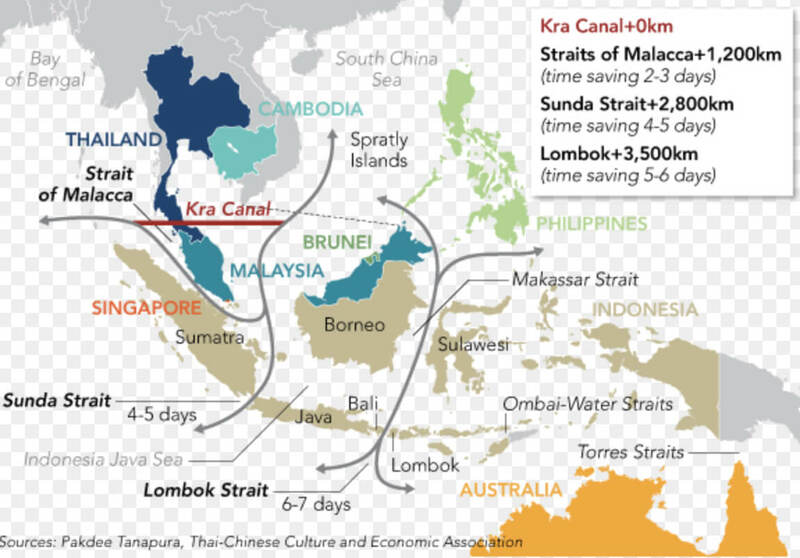 The Strait of Malacca is by far the fastest route between Asia and the Middle East/Europe. 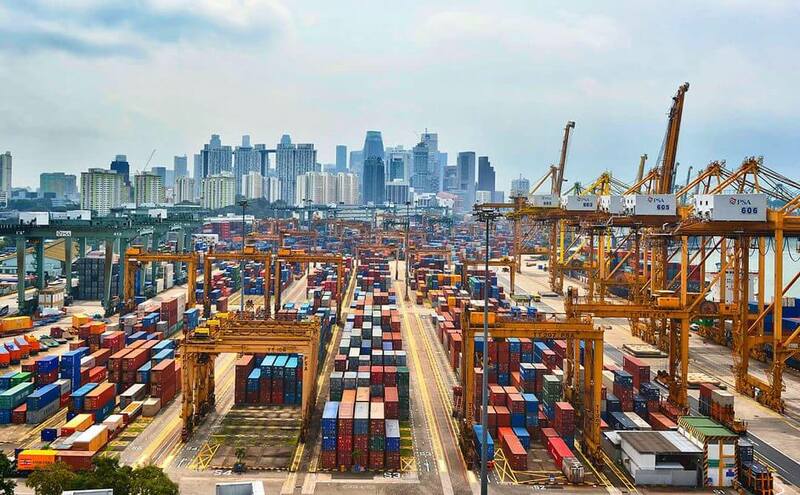 So naturally, Singapore became home to Southeast Asia’s largest port. More than 600,000 kilotons worth of cargo pass through the island every year, making it the third biggest seaport in the world. These factors all helped Singapore transform from a fishing village into one of Asia’s richest cities in just barely over a single generation. Ten percent of all households on the island are millionaires. You might say that, apart from good governance and hard work, Singapore mostly has its location to thank for its current status as a top international financial center. Straddling the Strait of Malacca, Malaysia is well-positioned for many of the same reasons Singapore is. Peninsular Malaysia can easily use global trade routes to its advantage by placing ports alongside the length of its western coast. In turn, they provide a convenient base for the hundreds of ships passing through each day to restock and refuel. Malaysia enjoys low natural disaster risk because of its location outside the ring of fire. Furthermore, they boast a plentiful supply of resources like rubber, petroleum, tin, and palm oil. Those exports form a perfect supplement to its convenient ports. Malaysia consists of two different parts. The peninsula connects to mainland Asia, with its western side bordering the entire Strait of Malacca. Eastern Malaysia shares the island of Borneo with Indonesia and Brunei. Not only that, but oil-rich East Malaysia enjoys simple access to Indonesia which is the fourth biggest consumer market in the world. Ships traveling through the Strait of Malacca are bound to all corners of the globe. Yet Malaysia only must look nearby to find willing buyers for its products. Myanmar, formally known as Burma, is strategically located right between India and China – the two most populous nations on the planet. Combined together, more than 2.5 billion people are practically on Myanmar’s doorstep. That equals immense perks with regards to connectivity, trade, tourism, and investment. The past few decades haven’t been kind to Myanmar though. While ranking among Asia’s wealthiest countries back in the early 20th century, a military dictatorship took over in 1962. The local economy quickly turned to ruin during the following years. Myanmar only began opening its economy to foreign investors very recently. As a result of extensive reforms that started back in 2010, they now have a stock market and laws allowing foreign property ownership. Well, it’s slightly more complicated than that. The Myanmar stock exchange has only five companies listed while zero condos have actually been built under the condominium act yet. Time will tell whether Myanmar can get its act together. But if they’re able to pull things off, geography will aid any resulting economic boom. You may be surprised to see Laos on our list considering it’s landlocked. They can’t easily grow their economy by manufacturing and exporting products. However, Laos also shares borders with more nations than anywhere else in Southeast Asia – five to be precise. And China is one of those countries too. As such, Laos boasts unique potential despite its full reliance on Thailand, Vietnam and other nearby foreign ports for shipping. It’s a great example of how one negative factor doesn’t ruin everything. 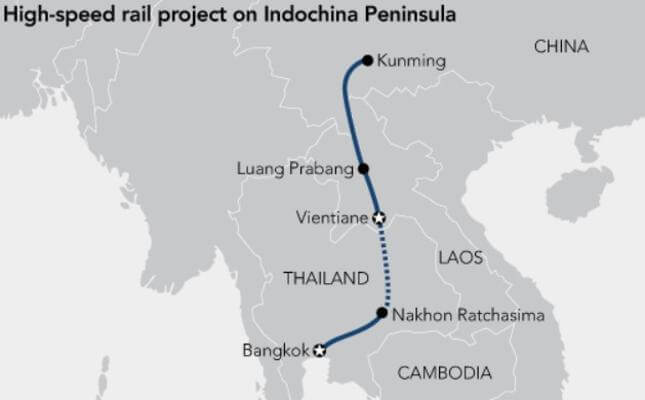 Because of its strategic location, Laos could become a major Southeast Asian railway hub – a potentially huge source of income for this tiny economy of 7 million people. Laos will benefit from its multitude of borders in several ways. First off, they’re fast becoming part of a well-traveled tourism trail in Asia. Proximity to popular destinations like Southern China, Thailand, and Cambodia means Laos is naturally being discovered as an alternative. Secondly, China is now building a high-speed rail system throughout the country. Laos is turning into a transport hub and should eventually connect to the rest of Southeast Asia via Thailand. Agreed! Not very competitive between earthquakes, tsunamis, volcano, along with 17,000 different islands to get between.